I couldn’t believe my eyes when I saw A.P.’s report that the popular North San Diego County Woods Golf Course ( aka Valley Center Golf Course ) was sold last week for a paltry $3.2 million to an undisclosed buyer. My amazement stems from the fact this is a highly-desired North San Diego County community with excellent schools and a relatively close proximity to freeways and colleges. The Woods Valley Golf Course is a 163-acre, par 72, 18-hole course located close to Harrah’s Casino and is central to the Newlands Community project in Valley Center. This new housing development will eventually host 270 country homes spanning a 430-acre territory. Pricing for these North San Diego County homes in Valley Center will range from $450,000 to $1.2 million. 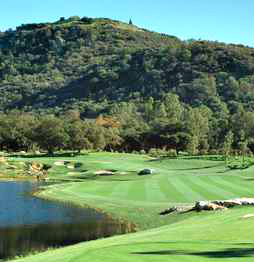 This Valley Center golf course is located at 14616 Woods Valley Road–and is part of the Newland Communities project in Valley Center. Thanks for keeping us up to date on San Diego developements! Looks like a fantastic master plan is coming to this area. Keep us tuned on further news breaks! Thanks for stopping by! Blake Cory uncovered this story and I had a hard time believing the price. What a bargain! Valley Center is a lovely community anyway, but the Woods Valley Golf Course and the Newland Communities Project will certainly add to its appeal. We’ll be watching it closely.